Ziphozihle Daniel Siwa (born on the 16th October 1955) is the current President of the South African Council of Churches as well as the Presiding Bishop of the Methodist Church of Southern Africa which spans 6 countries (Swaziland, Lesotho, Namibia, Botswana, Mozambique and South Africa). 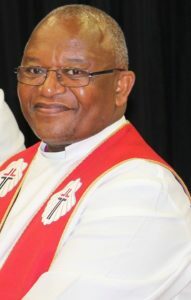 He had served in the past as Bishop of the Grahamstown District (2001-2008) and Highveld and Swaziland District (2009-2011). He graduated from Nathaniel Nyaluza High School in Grahamstown and between 1974 and 1985 held down several administrative and clerical jobs before he was accepted as a candidate for the Methodist Ministry in 1986. In 1996 he read for a Bachelor of Theology at Rhodes University majoring in Biblical Studies and Pastoral Theology followed by a BA Honours at the then University of Port Elizabeth in 2003. He is married to Yoliswa Joyce Joyi and they have four sons. Siwa believes that united Christian discipleship has the impetus to transform our world into a just place with individuals who recognise and uphold the dignity and sanctity of all life; a people who respect and protect the integrity of creation; a people who through quality education for all equip everyone to fight all forms of socio-economic injustice.